"RISE FROM YOUR GRAVE!" 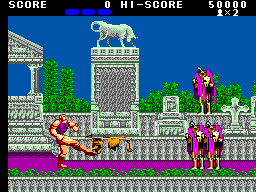 With those four words, history was immortalized on the Sega Genesis, as Altered Beast became Sega's first 16-bit title, and for a time, Sega's flagship title. Of course Sonic the Hedgehog would come around and basically remove all remnants of Altered Beast from the Genesis history books, save for those opening four words. In all its crushed, muffled glory, that opening sound from none other than Zeus was a truly iconic moment in gaming history. Too bad it's not in the Master System version. Yes, the Master System could handle audio samples, evident from the "Find the Miracle Ball" bit in Alex Kidd: The Lost Stars or "Get Ready!" in Space Harrier. But in Sega's typically frugal bit allocation (the same allocation that gave us in North America truncated versions of Enduro Racer and Captain Silver), we get only a meager text scrawl instead. "RISE FROM YOUR GRAVE AND RESCUE MY DAUGHTER." That's it, and that's about all the story you need to jump into this side-scrolling beat'em up. While on paper this may seem little more than your typical punch-kick brawler (there certainly was enough of them on the SMS with My Hero, Vigilante, Double Dragon, et al. ), you know you're in for something different when your hero is resurrected from the dirt. As if being under Zeus' command isn't rad enough, you're hero's a zombie, and one with some serious identity issues, at that. Other than the glorious graveyard setting, the other thing that is standout about this game is the shape-shifting of the main character. Basically, you start out as a Tarzan-looking fellow, complete with loin cloth. Along the way of punching the hell out of zombies, boars, leeches and crazed goats, you'll also come across three-headed wolves. Kill the albino one, and it drops you a "spirit ball" that will quickly change your status to one of three states (scaled back from the four of the Genesis and arcade). You first change from Tarzan Boy (cue the Baltimora) to a Speedo-wearing Hulk with vastly increased reach, speed and power. It's that second ball that really gives the game its name though, turning you into a level-specific creature. Roar! The game's implicit puberty fixation wouldn't be complete without the werewolf transformation for level one, and in the later levels respectively, you get to become a Weredragon, Weretiger and Gold Werewolf. Only four, you ask? Yep, Sega canned a level for this Master System port, so the bear beast unfortunately resides in exile along with the opening sound byte. It's no huge loss, though, since each beast handles fast and furious, each one having some destructive, kill'em all moves. So once you become the beast, you basically just wipe the floor with the enemies for a short period before the boss is triggered, at which point you rinse and repeat. Do this four times, and voila, you've saved yourself a Greek goddess! You won't have any trouble distinguishing this game from the arcade and Genesis port. Visually, this is a grossly scaled back version with choppy animation (although not as bad as the port of Makoto Uchida's other classic, Golden Axe), blocky explosions, frequent flicker, and sparse environments. The bosses take the biggest hits, their backgrounds completely removed during the battles, replaced instead with a static black. Even the transformations are massively simplified, that iconic flame-ridden morph screen almost non-existent. 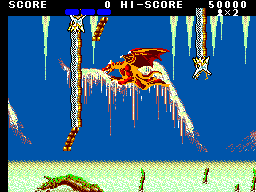 While most arcade ports took a big hit graphically on the Master System, Altered Beast really eats the dirt here. In its favor, though, Altered Beast does feature a nice variety of enemies, all of a big enough size to lend to some nice detail. The boss sprites are especially big, but again, with no background, it's kind of a bummer. While the disintegration of enemies into a flurry of pixels is laughable, the beast attack effects, from fireballs to sound waves, are all handled pretty nicely. All things said and done though, this beast is a mangy, anemic shell of its arcade kin. Okay, so they left out "Rise from your grave! ", a crime for which Sega will never be forgiven, but otherwise, the sound here is pretty notable. The score consists of a few really memorable themes. The first couple levels have this brooding and darkly epic track that really sells that post-mortem atmosphere and the gravity of the hero's quest. You'll be humming it all day. The score for the last two levels isn't as memorable, but it is commendably atmospheric, somehow embodying the tonalities of crawling creatures and frantic uprisings in that limited 8-bit sound palette. The last big track kicks in only when you morph into a beast, which is uproarous and fun. It's catchy, and certainly adds to the blistering intensity that's unleashed when you finally become the beast. There are even a few sound clips that did make the cut, including a game over wail, a demonic laugh, the transformative roar and even a "power up!" Not bad, but again, where's my title mantra? The enemies could have had a bit more audio presence, but the punching and kicking certainly rings through nicely. In terms of the score, I really think Sega did a commendable job here - in reducing the game's original score to the limited sound capability of the Master System, they still managed to retain the same audible atmosphere of the original game, and in a way make it even more potent with its simplified sound strokes. In terms of controller layout, Sega did a pretty good thing here. This was a three button game, designed with the Genesis in mind, and Sega thankfully does not scale back anything for this Master System port. Button 1 kicks, button 2 punches, and when both are pushed together the character jumps. Sounds like it could be finicky, but it actually plays very well. The collision detection is not nearly as noteworthy, however, with some pretty frustrating encounters, especially when the diagonals come into play. Not only is it tough to get a bearing as to where the enemy's hit zone begins, the game really punishes you if you miss. Basically, you get hit once in this game and you ricochet back and forth between enemies like a girl between the Butabi's in A Night at the Roxbury. So even though you have a bar of hit points, you get hit once and that's basically it for your life. The game can get really frustrating in its sloppy mechanics, but it still has an odd draw to it. The never ending entourage of slow punch fodder is strangely addicting. It's fun to punch away waiting for that power-up, and once you become the beast, it's a riot. The game is short at only four levels, but it can get difficult during the last two levels, especially accounting for the "Roxbury" effect noted earlier. There's a continue hack at the game over screen if needed, but finishing the game without it won't be tough after a few tries. Use it, and you've changed what's already a short hour of gaming into something more like fifteen minutes. Good judgment would suggest I give the fail to a scaled down version of an already ridiculed 16-bit game...but I can't. 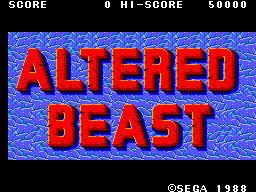 Altered Beast has a strangely addicting charm hidden within its clunky controls and subpar graphics. There's an incredibly cathartic feeling about punching a giant snake and having it crunch into a few giant blocks as it discombobulates on screen. It's sort of like one of those stress balls - so stupid in concept and simple in execution, but it still delivers. If not a stress ball, then the game should at least be remembered as being the thematically darkest entry in the Master System library, with a fantastically forboding soundtrack and some mean monsters. It's definitely not a masterpiece, but for horror fans, as Zeus would probably bellow if there were enough sound bits, this game more than rises to the occasion.